See how this global service provider’s culture emanates from their offices to their clients. CEO Lorna Donatone (L) meets with staff at Sodexo’s Gaithersburg, MD HQ. Image courtesy of Sodexo. Sodexo is a global service provider founded in 1966 by Pierre Bellon. Services vary in size and scope ranging from food services to facilities management, including efficiently designed workspaces and sustainable energy programs. The mandate for these services, as defined by the founder, is that Quality of Life, be a key driver of performance. Sodexo’s Lorna Donatone, CEO of Geographic Regions and Region Chair for North America, recently talked with us from their headquarters in Gaithersburg, Maryland about current planning and design issues in her region. Bob Fox: Let’s begin with an overview of Sodexo’s business and how your workplaces support that business. Lorna Donatone: With a presence in over 80 countries and over 425,000 employees internationally, most of our workforce is the front line, working in teams on-site or at customer facilities. Sodexo North America currently employs 125,000 people. Our North American offices provide a home base for all regional teams that support field staff in client facilities. Our multiple market segments include Corporate, Healthcare, Universities, Schools, Government, Sports and Leisure, Energy and Resources, and the fastest growing segment – Senior Services. A variety of services covers anything clients may need that is not part of their core business ranging from food service to facility management and anything in between. Our challenge is that we do not control the workspace for most of our employees. To ensure high engagement and satisfaction, we try and manage that by making sure that our employees are working in “the culture of Sodexo.” We work with our partners who provide workspace for our employees to meet that goal. Branding elements that support the Sodexo culture are integral to the new office space in Buffalo, NY. Image courtesy of Sodexo. You mention the culture that you try and maintain with your employees. Can you describe a little bit of that? Our business is based on three very strong values: Service Spirit, Team Spirit and Spirit of Progress. Those three values run throughout our business. Our culture is fundamental to the quality of life for our employees, customers, and clients. Our belief is that if we improve the quality of life for our employees and our customers, people are going to perform better. We also work very hard to create an inclusive environment. Sodexo has been listed as one of Diversity Inc.’s top 50 companies for diversity and inclusion since we have been participating in their survey. With over 425,000 employees we touch over 75 million consumers every day. To do that successfully we must have a workforce that embraces our values and that spirit of inclusion. How does your workspace reinforce those key values and inclusive behavior? We believe that workspace can influence engagement and collaboration. How people feel, and their quality of life affects how productive they are. We are focusing much more on the aspects of our workplace that we can directly control. How does Sodexo work together and share ideas? 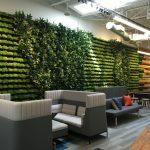 How does your space support collaboration among your employees? A lot of our collaboration is virtual because of our distributed workforce. We have space to support virtual meetings. Conference calls do not promote face-to-face communication, so we are looking at additional tools and technology that will allow us to see people when we are talking to them. I think that will be a differentiator. Workspaces and technology are not currently conducive to the kind of personal interaction that we need to be more effective. We want to have more of the right kind of spaces with fewer offices and more collaboration spaces. People are increasingly open to virtual offices and may not need assigned space. Of course, there are generational differences evidenced by differing opinions on the value of open versus private and individually “owned” spaces. People now entering the workforce are more accepting of less traditional work spaces. My generation – we like our offices! We are all trying to get used to less paper and less space. With so much that is electronic and technology driven, we constantly re-evaluate our space needs. Sodexo’s recently completed Buffalo, NY facility features multiple spaces for meetings and teleconferences. Image courtesy of Sodexo. A lot of current workplace design discussions are about choice. You have such a large workforce; how do you accommodate all the people and diversity? We are constantly evaluating what the right kind of workplace is. Based on our experience we must make some assumptions about what is going to work in the future and make our plans based on what we estimate we will need down the road. Sometimes we make a mistake. A few years ago, we did some minor renovation to a few floors in our Gaithersburg, MD, headquarters. We let our teams vote on how to configure their space. The demographics of the employees whom we asked were familiar with cubicles and offices, and that was in their comfort zone. That is what they selected and what we provided. The lesson for me was we need to find balance – – be careful what you ask for without benefit of guidance to capture what you envision! The result is that now we have underutilized space that does not mesh well with what we think will work for the employee of the future. I have seen some businesses that went too far with the concept of mostly open space. With an organization as large as Sodexo, there are some functions that do require privacy. Sodexo promotes diversity. You have a lot of employees with varying backgrounds and culture. How important is your space in supporting that? It is extremely important. The work environment sends a message. We want our space to be welcoming and create a positive first impression. People should see that our population is very diverse, and our work space is bright, open and convivial. We want the demographic differences among our employees to be visible. The employees of the future are looking for our ability to integrate more technology. Our atmosphere should reflect that even though our company has been around for over 50 years, our culture is constantly evolving. We want to make sure people are comfortable bringing their whole selves to work. We work to promote our diversity visually throughout our spaces and constantly reinforce it with our employee communications and activities. Sodexo is working to incorporate more design features to create a more open and inviting work environment. Image courtesy of Sodexo. I imagine with your business that you constantly need to innovate and improve your products and services. How does that happen? You are right about that. Our clients are constantly looking for innovation, creativity, and added value. That is what their customers want. For example, with food services, which is a large part of our business, we are constantly innovating with new recipes, new sourcing, or ensuring that our offerings are focused on corporate social responsibility. Along with our efforts on diversity and inclusion, we also want to be good corporate citizens, including how we manage our supply chain and carbon footprint. These things are important to us and carry over to our facilities management business so that we can bring our internal best practices to our customers. Our innovation initiatives in facilities management include energy savings and sustainability. Another area where we are constantly seeking new solutions is in our Healthcare segment where we are looking at better ways to manage infection control. How do those conversations about innovation and new challenges take place? Do they happen at Sodexo facilities or client sites? What kind of physical space and tools and technology is needed to support those interactions? It depends on what part of the business you are discussing. Let’s talk about sales. We generate most of our business through a bid process. Our sales teams go out and do sales presentations which are always on client sites. We are always looking for ways to integrate technology into our workspaces so that we can show potential clients how we work. Across all your space – as you have so much of it – where do you find your most valuable and biggest benefits? Throughout the office are ‘living labs’ that demonstrate what Sodexo can do for their clients. Image courtesy of Sodexo. Do you have any ways to measure the performance of your space? The key driver is employee engagement, and we do measure that every two years. Where are you most willing to spend money on your workplace? Right now, it is on technology. We must guarantee that our teams have the right technology to manage their work. We are also willing to spend on general work space improvement. 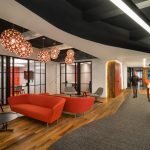 Sodexo’s new Buffalo office was designed to support their office-based teams. Image courtesy of Sodexo. When people walk into your space what is the message or experience you want them to have? Any person walking into a Sodexo office should feel immediately welcome. I would like to see more of a hospitality setting because that is what we do well in a lot of our everyday work. A large part of this is our people; our facilities should match and represent the quality of our employees. They are exceptional at what they do. They are the ambassadors of our Service Spirit, our Spirit of Progress and our Team Spirit. Our physical space should reflect our inclusive environment. First impressions are important, and we need to use our space to represent our work and our message accurately. How do you communicate with your direct reports? Do you use your office space, and how do you use technology and social media? Our team is all over the country, and all over the world. Conference calls are a staple in our organization. We are trying to utilize more video conferencing technology. I do use FaceTime for meetings that are one on one. With my global team, virtual technology other than conference calls can be difficult if we are in a location that does not adequately support those type of meetings (client site or other outside location). What do you look for when you are considering acquiring a new location? It depends on how we will use the space and what type of functions it will support. Typically, we look at what is best for the employee base and proximity to clients. Workspace has been evolving throughout my career. It used to be that you assigned somebody an office and that was it. The whole definition of work place has changed. Keeping up with the changes is a constant challenge. Did you enjoy Lorna Donatone’s insights? Come see her in-person as a panelist on September 14th at George Mason University (Virginia campus). Click here more for details. Behind the Curtain: Cox Designs for its Tech Dept.